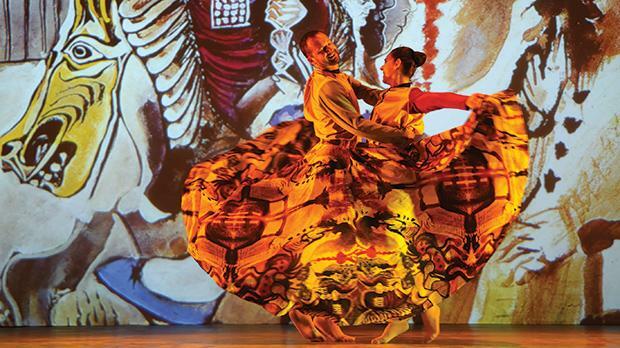 A show celebrating the 100th anniversary of the ballet Parade, which premiered in Paris during World War I, left an audience at the Manoel Theatre in Valletta in awe. This 20th-century masterpiece features music by Erik Satie, scored to a one-act scenario by Jean Cocteau, with costumes and sets designed by Pablo Picasso. Parade premiered at the Théâtre du Châtelet in Paris in 1917 in a production presented by Sergei Diaghilev’s Ballets Russes, with work on the piece having started in the middle of the Great War. The fresh take on the work – Parade and the Velvet Gentleman – revisits the ballet on an interdisciplinary platform that includes stop-motion animation, puppetry and projection dancing. Among other techniques, one of the characters is presented as a stop-motion animation figure projected on the screen, while the horse character adopts a contemporary headdress, mask and costume. One scene featuring acrobats demonstrates a technique called ‘projection dancing’: when dancers appear on stage and seem to cast a shadow behind them. However, this is actually a video projection that develops into a choreographic ‘dialogue’ between two dancers and their silhouettes. Parade and the Velvet Gentleman’s artistic director is Ruben Zahra, with the production’s choreography in the hands of Diane Portelli and Dorian Mallia. The production at the Manoel formed part of the Modern Music Days programme of events, which is committed to promoting the performance and understanding of 20th-century repertoire and contemporary music in Malta. One particular scene featuring acrobats demonstrates the ‘projection dancing’ technique.